You’ve got to admire a woman who is so passionate about her life’s work that the whole world knows about it every time she wears a backless dress. Meet GWS reader Becca, full-time librarian and aspiring first-ever human card catalog. Demonstrating a geeky passion that could only be punctuated by rainbows and stars, Becca had the Dewey Decimal number (with the Cutter cataloging code, natch) for Harry Potter tattooed on her back. I recently finished library school and decided to commemorate the experience with a tattoo that honors my favorite book series (and musical genre*) ever. And yes, she arranged for the tattoo to be colored in black and Slytherin green. No joke. Cheers, Becca. Thanks for sharing this geeky tattoo and for reassuring us that the rise of the internet still hasn’t extinguished the beloved species known as the saucy librarian. That is positively awesome – what a unique, if slightly crazy, way to show you’re a fan. You go girl! Really original idea. I used to be really passionate about Goosebumps, but I’m really glad I don’t have “You’re in for a scare!” tattooed above my crotch now and for the rest of my life. Dumb. The “7” at the end has a mole in it! Nice – but she should have got that mole removed first. But she’s screwed if it changes with one of the many updates to the Dewey Decimal System. To the librarian with the freshest tattoo I have ever seen: You are my dream girl. Wish I could fast forward to her when she’s 50 and get her thoughts. She’ll probably have it lasered off by then. How embarrassing. Actually Dewey created his cataloging system as a way to manage every book in a library, fiction and non-fiction. If you take a cataloging course you’ll find that one can actually apply a myriad a Dewey numbers to any given item based on the various subjects and topics in the book. The single number that a book winds up being labeled with is up to the discretion of the cataloger based on the needs of the library and patron base. Most libraries choose to only catalog he non-fiction collection under the Dewey system but if you go to your library you will still find plenty of fiction there anyway. Poetry and classic literature is often shelved there for example. As far as changes to the system rendering my tattoo invalid, my view is that the system can change quite a bit but most libraries don’t have the time or funding to re-label and re-catalog their whole collection because of it. My tattoo will always be relevant to the time I got it: when I finished my master’s degree. I admire people that are passionate about their lives, however tattooing a DD# hardly shows passion. Original idea, positively awesome, excuse me while I roll on the floor laughing. Inspiring awe: must have a dull life. 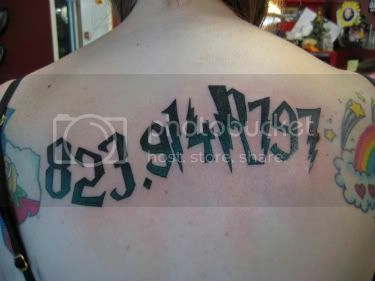 Original: tattooing numbers on people goes back a long way.